This little tiger is struggling to get on top of this bird perch. Wanting to get the birdseye view of the room, he is having a tough time. The mouse is no help. Head over to my Etsy Shop for more! 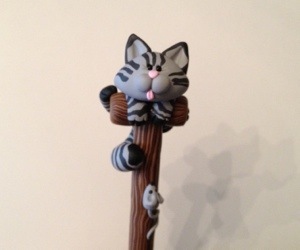 This entry was posted in Polymer Clay and tagged animal, cats, decorative pens, figurine, gift, handmade, kitty, sculpted clay, tabby, unique. Bookmark the permalink.